Ch. Kismet's Boy Named Sioux, NW B.I.M. "... Dealie completed her Register of Merit requirements in 1998, coming onto the Active List in the 22nd position with the highest number (248) for that year. She first appeared as a neophyte candidate in 1995.Dealie's qualifiers were Heart Throb and Hearts of Fire. She now has six qualifiers and five champions. Bob and Maryellen Kish have reason to be proud of Sweetheart Deals' contributions. 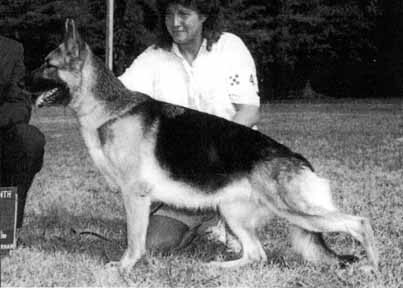 She has produced two outstanding Register of Merit males, 5X Select Champion Kismet's Heart Throb and Canadian Select Ch., Am. Ch. Kismet's Sight For Sore Eyes TC, HIC. Their combined wins propelled their dam to the number two spot on the Active List this year with 620 points."